How I love the fresh start of the New Year! It’s so incredibly cold where I live so I stay indoors and use the New Year as an excuse to clean and organize my entire house. When Christmas comes down, the labels and color-coordinating begins! Today, I am going to share some of my favorite Organizing Tips For the New Year and all my “go-to” containers to organize anything and everything! I just feel that if all things have a place, it helps to make this CRAZY yet wonderful, kid-raising life feel a little bit more smooth, or at least I like to think so Labels…For me labels don’t need to be fancy. A lot of time I just go on my computer, choose a font I like and print away. Every once in a while I do take the time to laminate the paper so the labels will hold up. The general rule of thumb is to make sure your labels are easy to read, especially while labeling for your children. For about 3 months, I didn’t have labels on the boys’ striped bins and their room was constantly a mess. But, the moment I took the time and labeled each bin, somehow the boys’ room stayed surprising cleaner. When I would ask them to put away the laundry, they did a pretty good job, thanks to the labels. Even the hubby found it easier to sort their room:) I kind of feel like sorting with labels can be a game or kind of like a puzzle! Haha…there is the clean freak in me! I suppose cleaning can be FUN, right?!? I also can’t live without labels in the pantry! Without baskets and labels my pantry it is out of CONTROL! Labels seem to help tame the mountains of food! 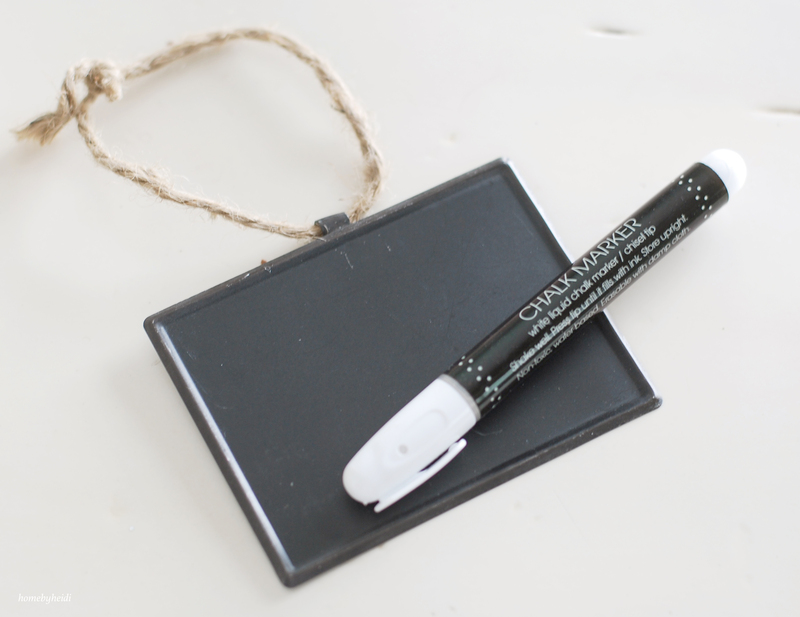 For my pantry, I picked up little chalkboards at my local decor store. They have been AWESOME. I have relabeled them several times! 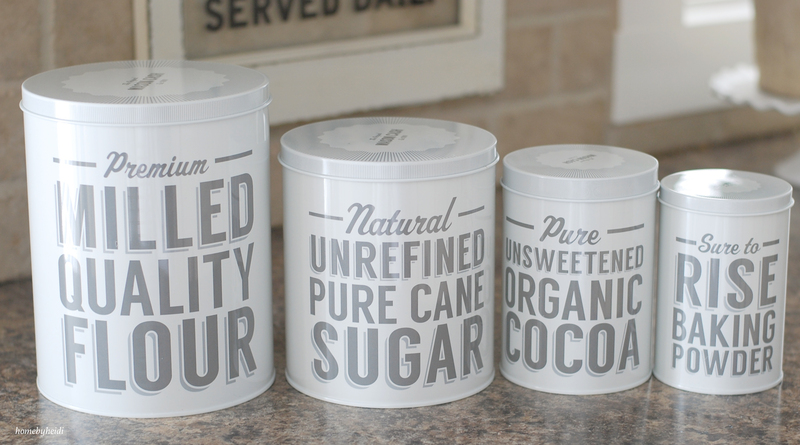 I also LOVE containers that are already labeled. 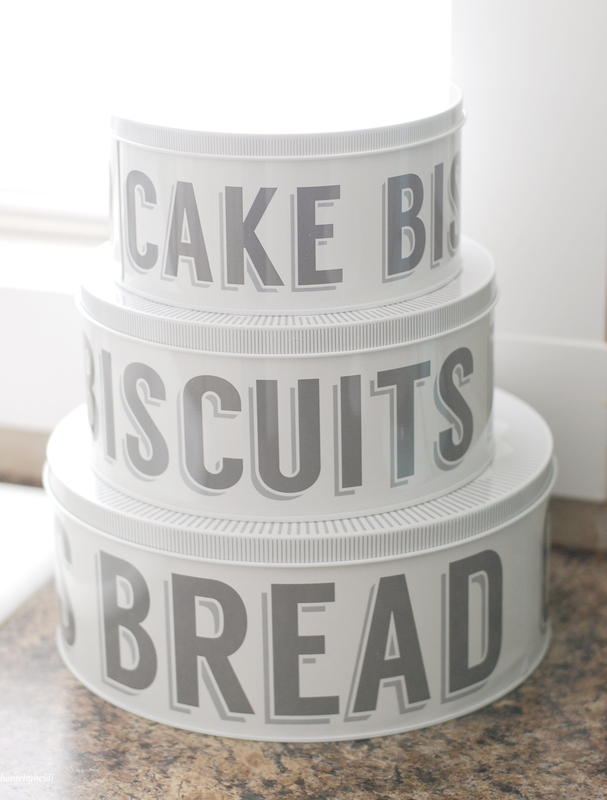 I found this set of tins online at homedecoraters.com What a fun way to store all your cooking dry goods! And it makes your pantry all fancy – who doesn’t love that?!? Color Coordinating… In my daughters room, her bow collection is “well” a little crazy I have a thing for bows and bubblegum necklaces and I needed a way to store them so that I was able to see and use them daily. I also decided to color-coordinate everything. I can’t tell you how nice it is to quickly scan over the bows and find the color you’re looking for vs. having to dig through ALL the bows and get lost. Tucked away in a drawer or box wasn’t working for me, so this shoe organizer came to the rescue! 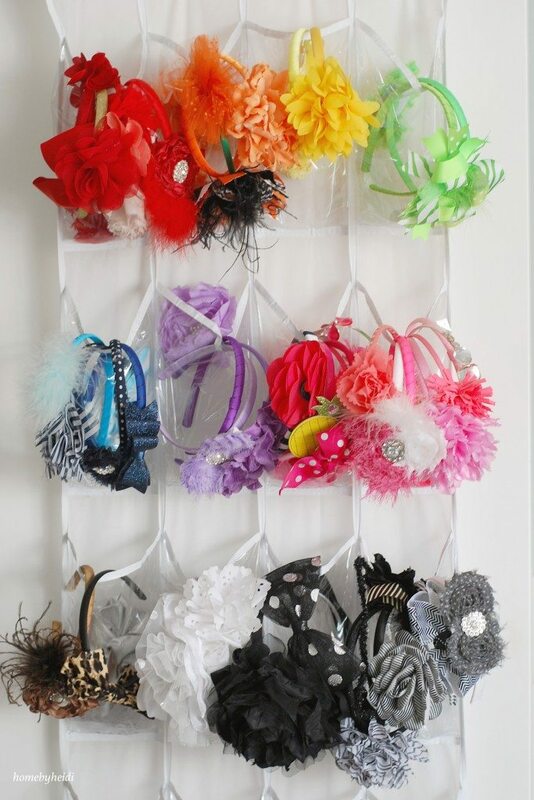 All styles and sizes of bows fit nicely. I even have some pockets below the bows for her necklaces. 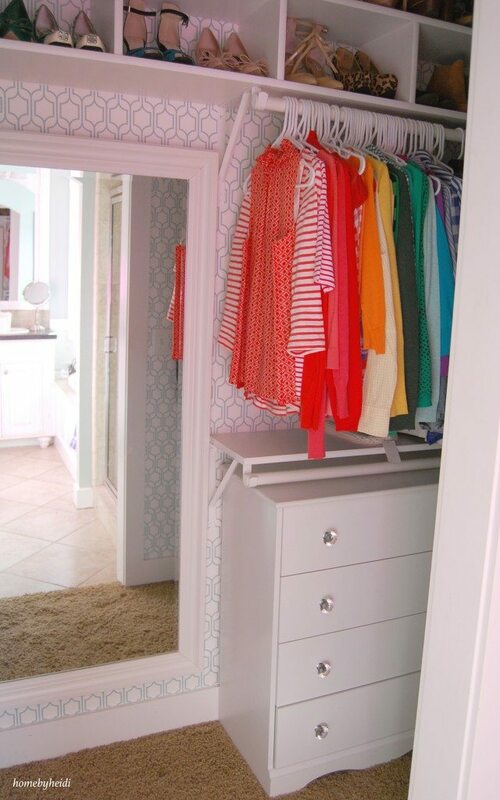 Another area in my house that I like to color-coordinate is the closet. By color-coordinating all my shirts, skirts and sweaters, it became easy for me to 1) know what clothing I have, and 2) putting outfits together is a pleasant experience vs. a morning nightmare. Before I started color-coordinating my closet, I would forget about clothes I owned and even WORSE, when I found them later, many of them still had their tags, YIKES! 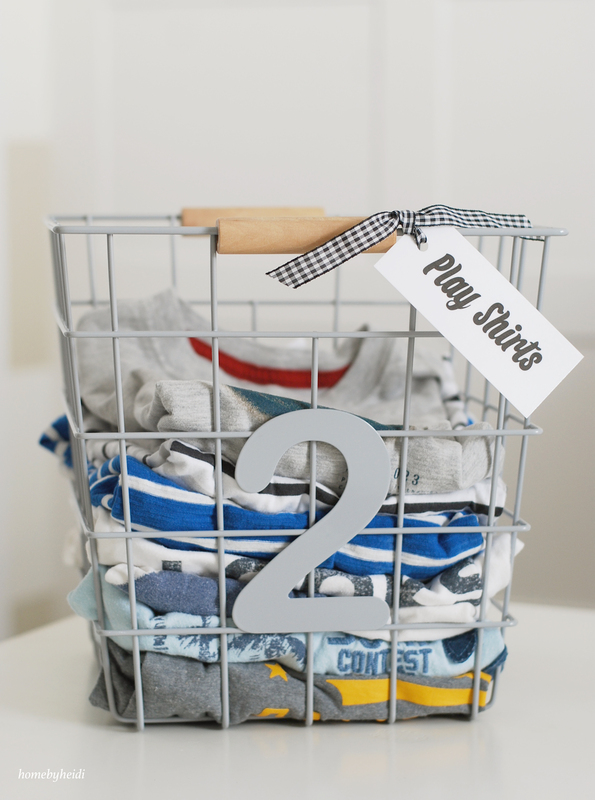 Containers… The right container and basket is KEY for organizing. I like to buy boxes and baskets that last. But I am also pretty thrifty and do not like spending a lot on basic items. I have found Target and Ikea are my go to places! Super affordable and CUTE to boot! 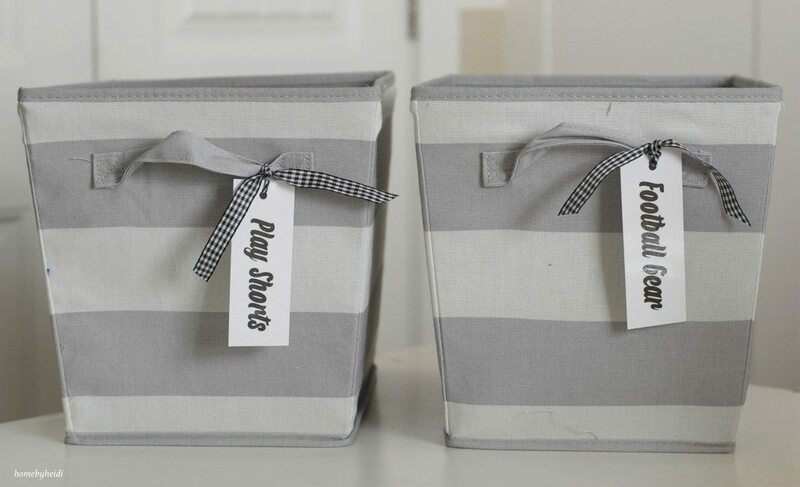 Bins… The striped gray canvas bins and metal baskets in the boys room are from Target. I LOVE them and they come in loads of colors. I am pretty picky about my canvas bins. They have to be strong with solid walls. The bins that can be folded down and stored away are not my favorite 🙁 after a while they lose their durability, and really… who wants to keep re-buying storage containers that fall apart?! I would rather buy a darling pair of shoes, am I right? Baskets… The baskets in my pantry are from Ikea. They have a HUGE selection of heavy duty baskets that last. I am always impressed by the quality and price. I have had the baskets in my pantry for over 2 years and they are still solid and going strong, even with 6 of us in the house eating how many times a day! I am a HUGE fan! I color-code everything too! I always tell my clients it works so much better when you need to find outfits in a hurry. And it makes things easy to visually see everything you have! Love the bins with the labels as well.